The sign to watch for! 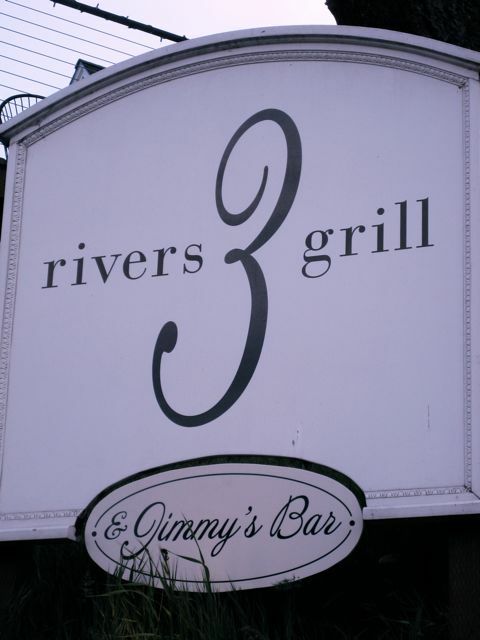 Three Rivers Grill is located on 3rd & Oak Street in Hood River, which basically means the downtown area. It’s a great little place we have been to many times. We drive back and forth between Portland and Eastern Oregon to visit family and we plan our eating stop around Hood River and all it has to offer. And at least one way, coming or going we hit 3 Rivers Grill. 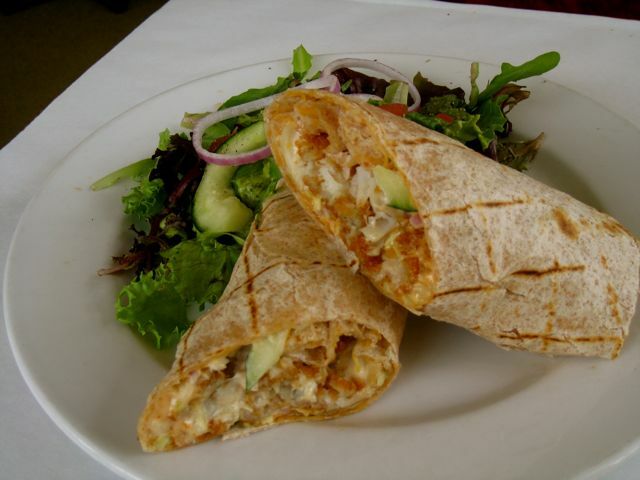 The lunch menu is much more affordable and it has an item that my husbands just LOVES. He always, and I mean always, orders the Mexican Style Fish Wrap. It’s like a giant fish taco with breaded fish, slaw and chipotle sauce. It is quite large and amazing. I won’t lie, it’s almost embarrassing to go there with him to get this Fish Wrap. It’s like a secret love affair he has with this thing. He stares at it, eats it slowly and makes noises. It’s like he’s cheating on me. He won’t even talk to me when he has the Fish Wrap in his hands. One time I made the mistake of asking if he wanted to share it. Our marriage has survived a lot over the years, but I was really pushing it that day. This trip I got the Fish Wrap and shared with my daughter but my son ordered the Pasta Fettuccine with chicken. It was really good. In the winter they run a steak special. They have lots of things on the lunch menu worth trying including the carne asada tacos, Lamb Shwarma and some of the salads. The view is great. You can see the river. In the summer you can sit outside, but be warned it’s windy. It is the Wind Surfing Capital of the World after all. But still with the warm sun it’s worth sitting outside. 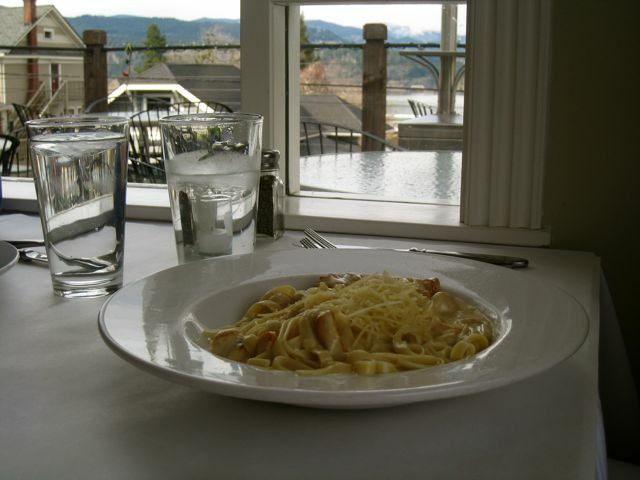 We went again on a recent trip, November ’11, and had another great meal. The main reason we stop is for the Fish Wrap, which my husband got again. I did manage to get a bite only because I got the Crab cakes. Both entrees were served with a big mixed green salad with a green goddess dressing and the crab cakes came with a chipotle sauce. I had not seen the crab cakes on the menu before, so I was pleased to see them and thoroughly enjoyed them. Atmosphere is light and bright with big windows over looking the menu. Great little bar area too and a space for larger crowds. Price is about $10 a plate for lunch and $15-$20 for dinner. We have had beers here in the past. They always have something on tap and are willing to let you sample until you find the right one. There is a large wine list and cocktails as well. Hood River has so much to offer. Check out some of the different activities HERE.